Apple CEO Tim Cook has told the The Irish Independent he has no plans to converge Cupertino’s lovingly crafted iPad and Macbook hardware lines into a hybrid tablet-plus-laptop device — arguing that melding the two device types would undermine the user experience. And not-so-subtly throwing shade on rival Microsoft’s approach to converged computing in the process. The latter of course recently unboxed the Surface Book — a hybrid laptop-tablet it’s hoping will chase the iPad out of the enterprise, even as Apple doubles down on the demographic with the launch of an iPad Pro. 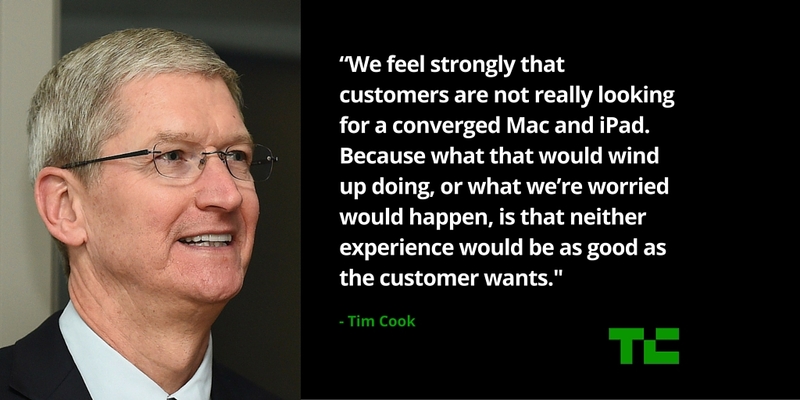 His comments clarify remarks he made earlier this month to The Telegraph newspaper, on a publicity drive to drum up noise to accompany the launch of the iPad Pro, in which Cook had appeared to suggest he thought there was no longer a role for PCs in a world of increasingly powerful and capable tablets. However he has now made it clear he was referring specifically to Windows PCs, not Macs — telling the Independent: “We don’t regard Macs and PCs to be the same”, and arguing that while the difference between the chipset architecture of the Mac and the iPad is “much less than it’s ever been” there is still a difference in how users use both device types. “What we’ve tried to do is to recognise that people use both iOS and Mac devices. So we’ve taken certain features and made them more seamless across the devices. So with things like Handoff we just made it really simple to work on one of our products and pick it up and work on the next product,” he added. TechCrunch’s own Microsoft watcher, Alex Wilhelm, remained on the fence in his review of the Surface Book, suggesting “in its current form, the Surface Book will either be a direct hit for any given consumer, or too much”. While reviewing the iPad Pro, TC’s editor and Apple watcher, Matthew Panzerino, argued that computing is not about any single solution but increasingly down to shades of grey. “I am not willing to declare the personal computer (non-Cupertino definition) ‘dead’. I’ll leave that to the bombasts. But there is a certain (sorry) norm-core computing demographic that could very well end up with an iPad Pro as the ’enhanced’ component to their smartphone, which is their real computer,” he wrote. It’s also worth noting that hybrid devices are nothing new. Android OEMs have been trying various configuration of phone-tablets and convertible laptop-tablets for years. What’s a little shinier here — in terms of approach — is Microsoft pushing a converged OS across multiple device types, with Windows 10, a strategy that in turn directly contrasts with Apple committing to retaining separate (yet interoperable) mobile and desktop OSes. On the one hand operating system convergence suggests the prospect of simplicity and interoperability across multiple device types — hence Cook stressing Apple’s focus on usability, and features to improve interopability between Apple hardware. But, while convergence might imply improved simplicity, it’s notable that users often resist moves to collapse distinctions — perhaps because they appreciate subtle distinctions, and perhaps also because they don’t appreciate the loss of control (and privacy) that can occur when walls are knocked down. So, for instance, people do not typically conduct all their communications via a single platform like Facebook but rather use multiple different apps and services — depending on who they are talking to and what they want to say. Such comms behavior is sophisticated, not simple, but is also (often) preferred. So Cook’s view that users actively seek out and appreciate distinct computing experiences, rather than rush to collapse distinctions, does not feel a stretch. Of course, it’s in Apple’s interests to maintain the value of distinct classes of computing hardware, given its business is a hardware one. And on that score Apple rivals pushing device convergence is also a strategy to directly attack the value of Cupertino’s premium hardware business by foregrounding software. But just because you push convergence at users, doesn’t mean people will embrace it. Software might be eating the world but it remains to be seen whether it can gobble up Apple’s hardware business.